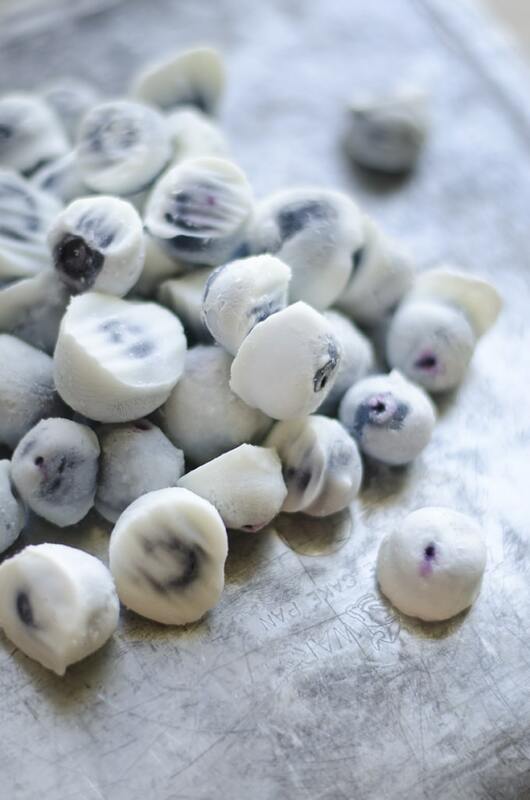 These Frozen Yogurt Blueberries are a simple, healthy snack that satisfy your sweet tooth big time. 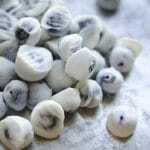 I’ve always loved snacking on frozen grapes, but being that it is blueberry week (and beyond hot outside), I thought why not change it up and freeze some blueberries for a snack. But let’s really change it up, let’s dip them in yogurt first! Well at first I really really changed it up, trying to get all fancy by mixing up plain Greek yogurt with lemon juice and powdered sugar. But sometimes there’s such a thing as too fancy. The lemon juice caused the yogurt to freeze all funky and my frozen blueberry bites just were not all they could be. So then I took it back to the simple basics. 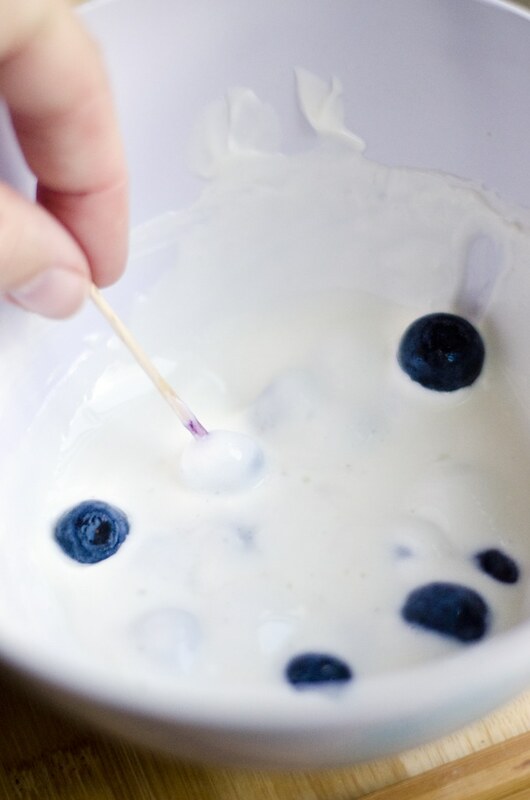 A light yogurt + blueberries + freezer. That’s it. 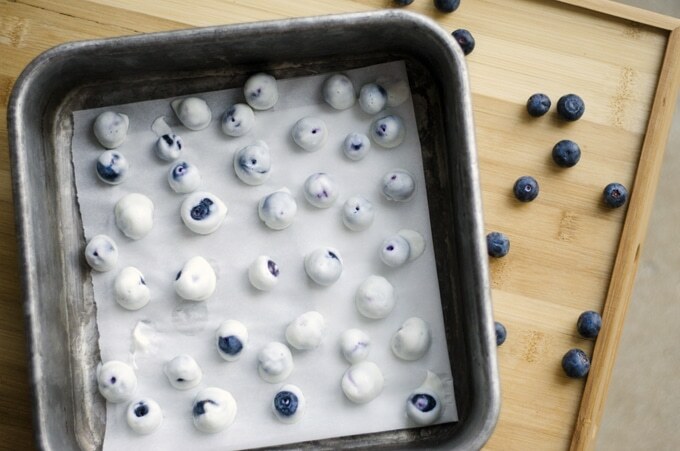 Frozen yogurt blueberry bites. A refreshing summer treat! Place single-layered on a parchment or wax paper-lined cookie sheet. Freeze for about an hour (they should freeze fast). I make this all the time with all different kinds of fruit! it is such a perfect snack. Oh yum! What are some of your favorites? Have you (or anyone) tried it with strawberries and cherries? If so, how are they? Do they turn out as good as the blueberries? I really like the looks of this recipe. I will be trying this later today. This is a great idea. 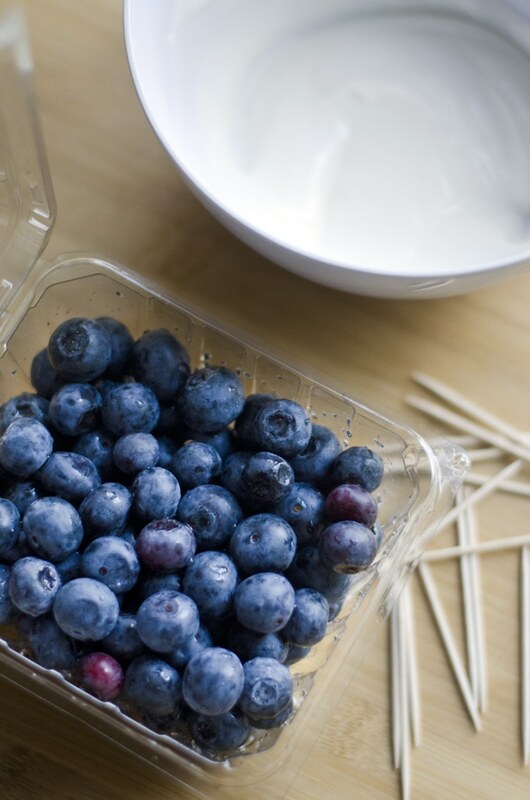 I am so excited to make these, blueberries and cherries… Yum! This looks like the perfect little snack for these hot summer days! Thanks so much, Lela! I’m with ya. With no air con I could just about eat these for breakfast, lunch, and dinner! How about banana chunks dipped in banana yogurt! Mmm, how long can they be outside the freezer? These were amazing! Thanks for sharing. My kids loved them and so did I. The perfect snack after playing outside on a warm day. I used whole fat plain Greek yogurt with 1/4 tsp pure vanilla extract and 3 drops of organic Stevia. Keeps me in ketosis as well as healthier. Thanks for the idea. Pingback: The Healthiest Snack Foods For Weight Loss – Skinny Ms.